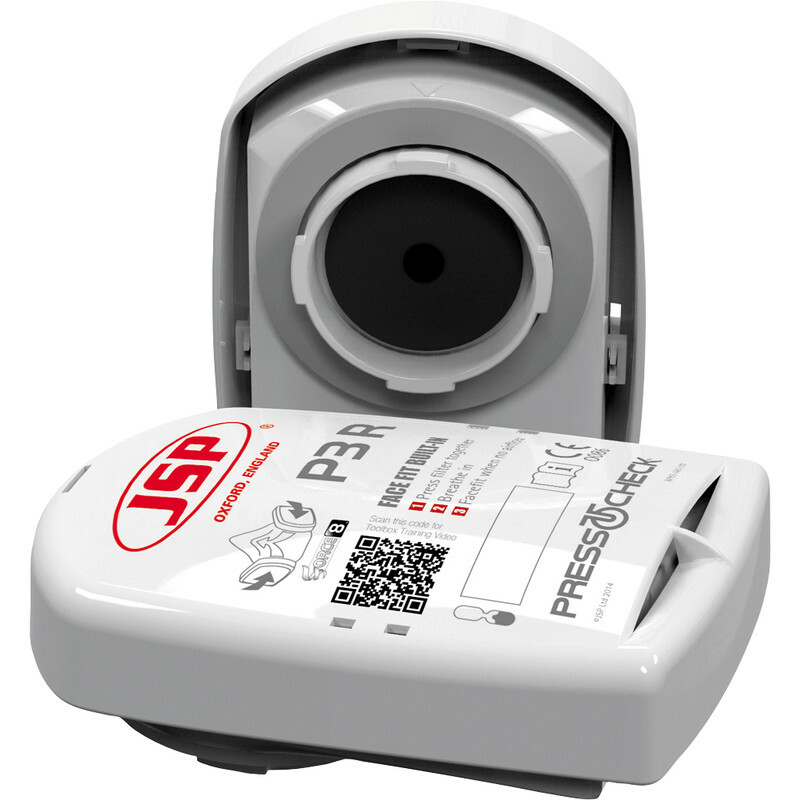 JSP P3 PressToCheck Filters (2 Pack) is rated 4.8 out of 5 by 92. Rated 5 out of 5 by dvector from Take a deep breath! Finally a mask system I feel that actually works, can breath deeply no problem without restriction, and no misting up glasses and googles. The PressToCheck is brilliant, gives confidence you are wearing the mask correctly. I use this mask almost daily for any type of cutting, mdf, concrete dust, moving or working with insulation. Especially noticed works well in old buildings/ loft spaces, I no longer choke to near death and can continue working in confined spaces. Rated 5 out of 5 by Pmatt from Effective and comfortable I bought this when I started to cut some sheets of foam roof insulation to fit between the rafters and found the very fine light dust was floating around everywhere. The cheap disposable masks were useless but this one has been excellent. Plus point is that seal around my nose and face stopped my breath fogging up many glasses. Rated 5 out of 5 by Paulos from Perfect fit. Perfect fit, spot on. Recommenced. Rated 5 out of 5 by Regency from Jps force 8 mask Needed a mask while pulling down a lathe straw and plaster cieling thick black soot ect . The mask saved me from a very unpleasant day of coughing up stuff . Im old school so first time with this sort of gear . very easy to use and reliable . Rated 5 out of 5 by Nicnikt from Best mask ever have Nice safe fit well to the face. Got two of them now. Rated 1 out of 5 by Anonymous from Don't Believe The Hype I bought this mask as I had left my 3M one at work and wanted to strip wax from my stairs. I have had non-3M masks before and always found them inferior, however I was swayed in this instance by the price and the almost universally positive reviews. I shouldn't have been. Despite the product description stating that the mask: "Provides filtering protection against particulates, many gases and vapours," as well as several of the reviews stating that the mask protects against paint and varnish vapours, this is simply not the case. I was using wax remover (a strong solvent) and noticed little to no difference either with or without the mask. I could smell the solvent and was steadily intoxicated despite finding a good seal using the 'press to check' feature. Disappointed, I did some digging and found that the filters the mask comes with (https://www.toolstation.com/jsp-p3-presstocheck-filters/p95042) offer "Particulate protection only." What a waste of time. Sure, I could upgrade the filters, but then I might as well have spent the extra money and bought a 3M mask that I know to be effective. I feel I have been mis-sold on this item and will be returning it directly. I am only left asking myself how this product could have so many positive and ultimately misleading reviews.